The Phoenix rises! The popular Marvel Gallery line of PVC dioramas continues with the first member of the Uncanny X-Men to join the line, the telepathic/telekinetic host of the Phoenix Force, Jean Grey! 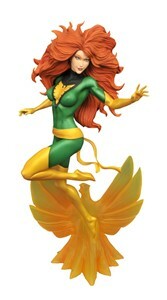 Standing approximately 10" tall, this diorama shows a happy Jean Grey in her classic green costume, hovering over a fiery Phoenix symbol! This PVC figure features detailed sculpting and paint applications, and comes packaging in a full-color window box. Sculpted by Alejandro Pereira!